It's a good shape and all, but it looks like it could be more of a micro fighter than anything steam related. Yeah, steampunk implies steam engine, which usually involves a broiler, gears, tubes, and, of course, steam. It also should be reminiscent of the late 19th century Victorian era. This think looks a little too sleek and well-put-together for steampunk. Meh, you guys are so nit picky. I suppose it's not totally steampunk but, hey, I wanted to build something. Well, it's good, just don't go putting false labels on it. Yeah, or we'll hit you. I think the one flaw with this is the back. Maybe try to bulk it up a little, right now it just looks like some sort of water raft. Try to build the area around the antenna up a couple brick heights. Everything else looks good, the sides, the cockpit, the back. It just looks a little squished to me. Well, however one categorizes it, I really like this little craft. It's small, sleek, and grey, which make it high on my like list. I really like the little antenna, too. 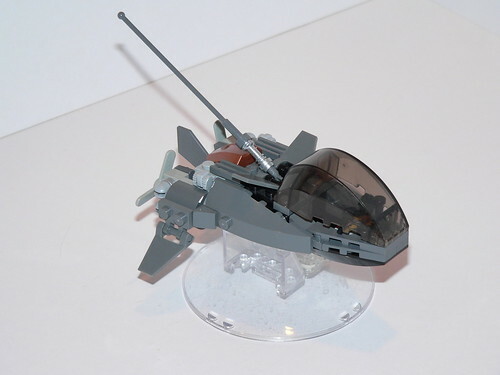 Looks like a fun little moc. Good work! Yeah, steampunk implies steam engine, which usually involves a broiler, gears, tubes, and, of course, steam. Curses! My one weakness revealed! I can never differentiate between boiler and broiler.